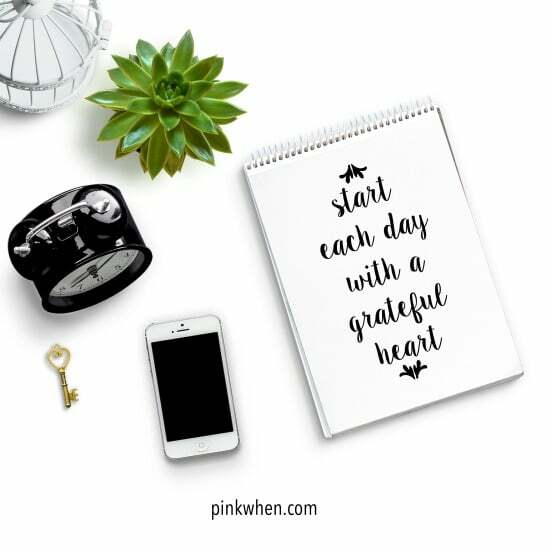 Start each day with a grateful heart. I am so in love with this beautiful quote. This past year has been one of the hardest, toughest years of my entire life. I have honestly never felt so lost, so inadequate, so unsure of myself as I have in the last year. There are times when I honestly feel lost, but I have to always remember to give my burdens over to God and realize that I am not in control of anything. I must be grateful for what I have and for what I will or won’t have in the future. It spoke to me so much, that I had to re-create it and share it as a free printable for you as well. Life can be so uncertain for us all, but sometimes there is a little light that shines and it let’s me know that I am not alone. None of us are alone. I hope this printable speaks to you the way it spoke to me. Now whenever I am feeling down, I can always look over and see this simple and beautiful grateful printable. Click below to download and print this quote.